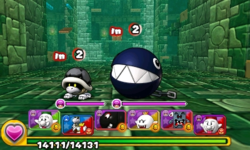 World 5- Tower is the seventh course of World 5 in Puzzle & Dragons: Super Mario Bros. Edition. It is a tower level with enemies consisting of Yellow Koopa Troopas, Dry Bones, Chain Chomps, Bony Beetles, Bone Piranha Plants, and a boss fight with Boom Boom. Clearing this course once unlocks Green Yoshi as a Helper. This level is straightforward, consisting of five battles then the boss fight with Boom Boom at the end. Boom Boom begins the fight by attacking with First Strike. ★World 5- Tower is a difficult version of World 5- Tower from ★World 5, with Heart Orbs disabled from the Orb field. Clearing this course once unlocks Light-blue Winged Yoshi as a Helper. When a Yellow Koopa Troopa is accompanied by a Dry Bones, it drops 8 Coins upon defeat. When fighting two Yellow Koopa Troopas, each one drops 8.5 Coins instead for a total of 17 Coins. This page was last edited on April 8, 2019, at 01:10.